There is no shortage of Green Tea Leaf in Pandaria. This is among the most abundant herbs and one of the easiest to farm. There are a few factors that come into play to help determine its price. First, it’s found in large quantities only in Jade Forest, so the only people who will have this are characters who go back to Jade Forest to farm, or characters who just leveled to 90. Second, it’s not used a lot by alchemists, so the biggest “user” will players with inscription. They buy Green Tea Leaf in large quantities to mill for pigments. Usually Green Tea Leaf’s price is right around the other herbs. It sells best in stacks of 20. Update: You can make a lot of gold with Green Tea Leaf, but if you want to step it up and make thousands of gold you should read my personal favorite guide. 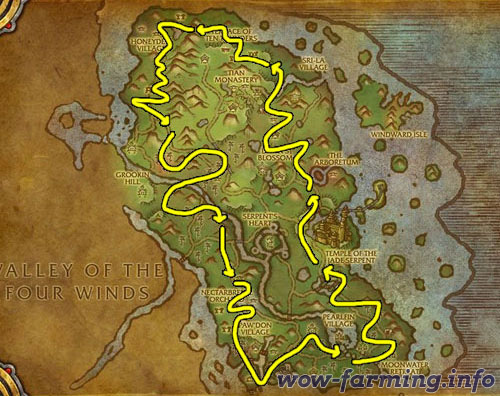 Green Tea Leaf can be found all over Pandaria, but it’s found much more often in Jade Forest.